Romantic Eco Luxury, Great Service, & Spectacular Wildlife! Four nights for the price of three! Details below. Discover this award-winning luxury eco-lodge and the vibrant flora and fauna surrounding it. Featured in National Geographic’s Unique Lodges of the World. Book three nights and get another night for FREE. Valid for select travel dates between April 21th – December 21st. Save up to $1238 during your stay. 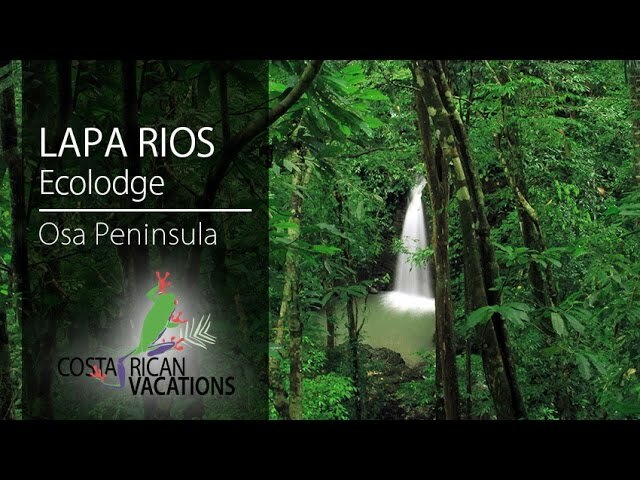 Located in the remote Osa Peninsula, Lapa Rios Ecolodge is a true gem among Costa Rica’s eco-resorts, a boutique, eco-sanctuary nestled in the wildest part of the country. Set along 1,000 acres of private reserve in Central America’s largest remaining Pacific lowland tropical rainforest, Lapa Rios is perfect for families, couples, nature lovers, and anyone looking for an enriching and unfiltered stay in the jungle! Guests will be picked up at Puerto Jimenez airstrip (just 50-minute flight from San Jose) and taken to the lodge for check-in. Lapa Rios consists of 16 open-sided, thatched-roof bungalows, each with netted bed(s), ceiling fan, safe, indoor and outdoor showers, and private deck with lounge chairs and hammock. Coffee, tea, or hot chocolate can be delivered (by request) to your bungalow each morning, as early as 5 am. Dining at Brisa Azul Restaurant is fabulous, and their detail-oriented staff will ensure a pleasurable dining experience each time. Guests have a full, a la carte meal plan for breakfast, lunch, and dinner. Menus are extensive and offer an array of local favorites and international dishes. Vegetarian and gluten-free options are plentiful! In case you still have room for a snack (the portions are really generous! ), there are banana bread and coffee for early risers, and chips and dips laid out on the main deck throughout the day. They also offer a fully-stocked bar for afternoon/evening cocktails. Food and beverage service is available by the pool as well. Explore the jungle trails to various natural surrounding beaches. Some hikes are long, so bring water and repellent. The two beaches in front of Lapa Rios are safe for swimming, and there are surfing lessons available, too. The hotel is committed to environmental protection. It was certified by the Costa Rican Tourism Board with a Level 5 (highest available) CST (Certificate of Sustainable Tourism). A selection of on-site guided tours. Depending on the length of your stay, you can enjoy nine different tour options, including the night walk tour, early birdwatching tour, two different hike trails, sunset tour, etc. Three full a la carte meals a day, accompanied by non-alcoholic/non-mixed beverages. Coffee, tea, soft drinks, and snacks are available at the restaurant throughout the day. Round-trip transportation to Puerto Jimenez airstrip. Wildlife greets you at your door with the enchanting cry of exotic birds like the famous scarlet macaw or the graceful canopy leap of the squirrel monkey. This eco-friendly resort was the first of its kind in the region and continues to offer first-class luxury service amid an ever-changing remote landscape. Each bungalow features a private deck and patio garden, complete with an outdoor shower, ocean views, and beds draped in mosquito netting to create a private, romantic setting. Miles of private, uncrowded trails in the prime rainforest with cool rivers that run wild through waterfalls, pools, and unspoiled sandy beaches await. Contribute to the Lapa Rios reforestation program by transplanting a primary rainforest seedling to an area of secondary growth. Rappel a waterfall, swim with dolphins, or learn to surf – Lapa Rios has an endless list of activities to suit all.